This clear acrylic sign holder/picture frame is top/side loading. It stands vertically for viewing from both sides. This frame has 1/2" thick base for added weight and stability. 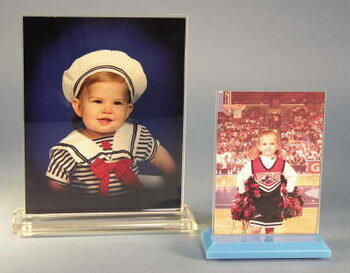 This clear acrylic sign holder/picture frame is top/side loading. It stands vertically for viewing from both sides. This frame has 1/2" thick base for added weight and stability. The base is beveled and polished for an elegant presentation.